Eschewing the generic Season Pass label many games are using to package together downloadable content, Sony and Naughty Dog opt for the much classier Fortune Hunters' Club to give Uncharted 3 fans a discounted price on upcoming DLC. 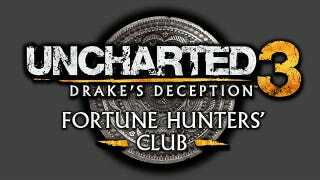 Available now for preorder on the PlayStation Store and at select video game retailers, the Uncharted 3 Fortune Hunters' Club allows players to drop $24.99 on more than $45.00 worth of downloadable Drake goodness. Drop the cash entitles the player to the first four multiplayer map packs and the first three skin packs, the first of which is due out next month following the game's November 1 release. Players will also score an exclusive Fortune Hunters' Club theme, and will be alerted to new DLC releases via messages on the PlayStation 3's XMB. That, and they'll be in a club! Who doesn't enjoy being in a club?